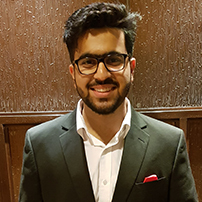 Raghav Mutreja will graduate from Birla Vidya Niketan, Pushp Vihar (BVN), New Delhi, India this year. His interest in a holistic development commensurate with a will to give back to the community made him venture into leadership roles with Basketball team and Computer Science Club and helped him ideate Project Saksham and Abhudaya. He was the Captain of School Basketball Team and apart from that his leadership skills in management of the Junior Girl’s Basketball team at Junior NBA trials in the absence of the coach were appreciated by the school management. Project Abhudaya (A New Beginning) involved working with Sports God Foundation of India to recommend digitization of monitoring process and use computer based learning modules to motivate underprivileged children to study and hence reduce absenteeism from school. Project SakSham (Senior Citizen Empowerment Initiative) involved bridging the gap between the technology available for use and technology actually put to use by geriatrics of our society to enhance the quality of their life. The ideation, execution and thorough involvement in ventures were aimed at making an impact on the lives of peers and the society at large.